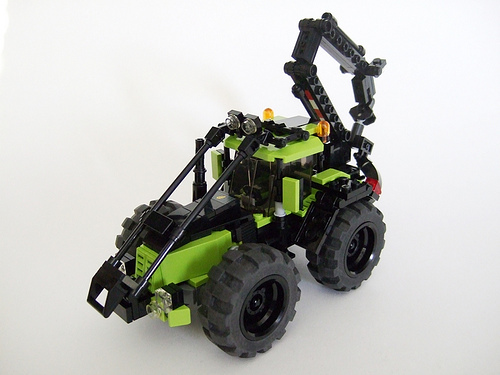 No less industrial (or lime) than a Power Miners vehicle, Aleksander Stein‘s TreeHugger 8000 looks ready to roar into a forest and cart off the raw materials for all those disposable chopsticks, paper napkins, and sticky notes in your house. Now, doesn’t that make you happier that LEGO is made from hydrocarbons? Aleksander has incorporated lots of nice details in this logging apparatus, including an excellent brick-built warning stripe on the crane, so don’t miss his TreeHugger 8000 photoset on Flickr. Thats Hot. So life like. “disposable chopsticks, paper napkins, and sticky notes in your house”… Not to mention 90% of the house itself right? Great skidder btw. Feller-buncher next? There’s something I just love about this…but I can’t put my finger on it.